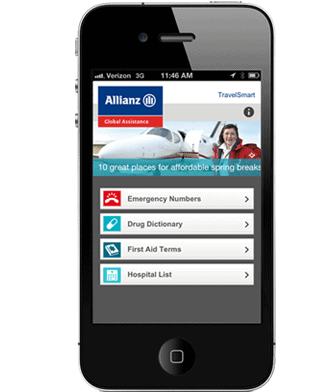 Because stuff happens when you least expect it and may be least prepared, travel insurer Allianz Global Assistance has just launched a new smartphone app, called TravelSmart™ that provides emergency information and contacts for international travelers. Of course, use of the app is dependent on having an Internet or Wi-Fi connection, which can often be tricky when traveling. While the app is free, message rates apply and vary depending on your local carrier. The TravelSmart free app can be downloaded and accessed at from the Alliance Global website or from the Apple App Store at and in the Google Play store. Sounds like a good app.